Portland, Oregon: Ma Nao Books, 2014. Edition of 25. 5.75 x 4.25"; 32 pages including end pages. Printed on an Epson printer. Hinged rigid-page structure. Paper-covered boards. Numbered with artist’s stamp on the colophon. Margaret Davis: "Inspired by the sleepers found throughout the Middle Kingdom, Chinese Dreams captures the ritual midday nap as practiced from Beijing and the port metropolis of Tianjin to the remote reaches of Hunan Province. The 11 images appeared in a solo show that marked the beginning of the Year of the Horse. The binding is a hinged rigid-page structure that allows the book to lay flat and for full presentation of the photographs." Portland, Oregon: Ma Nao Books, 2011. Edition of 25. 4.25 x 5.125"; 6 pages. Letterpress printed in French (colophon in English), with digitally polished Polaroid transfer set in with photograph album corners. Set in 14 pt Cloister and Minuet. Title printed on cover. Sewn binding with wrap around covers. Slot and tab closure. Margaret Davis: "When Charles Baudelaire published his Fleurs du Mal in 1857, the authorities quickly moved to condemn many of the outrageous poems in it. L’Invitation au Voyage was not one of them. It is, instead, a haunting meditation on travel, where it takes us and where we want to go—and the torture of wanderlust. Of all the translations available, I'm partial to Edna St. Vincent Millay’s. Read it, and seek!" 4.125 x 3.625"; 14 leaves plus endpages. Typefaces from American Uncial to Zebra. Letterpress printed on various papers including Fabriano Elle Erre. Lama Li endpapers. Handsewn binding. Brown paper wraps with title on cover. Saucymorons presents 11 pairs of words such as "toxic asset" and "natural food" for thoughtful consideration. Margaret Davis: ""I blame it on the stimulus package. How could something so potentially exciting as a stimulus come to be married to something so banal as a package — and carry any meaning? "Suddenly I heard such saucymorons everywhere. A wink beyond close relative the oxymoron — jumbo shrimp, &c.— saucymorons pose little riddles of language and seem especially suited to an eclectic array of type. "Ma Nao Books welcomes nominations for future Saucymorons editions." Portland, Oregon: Ma Nao Books, 2008. Edition of 10. 7 x 4.25"; 8 leaves. Accordion structure. Letterpress printed. Laid inside a slim red cloth-covered custom binding. Paper title label on spine. Margaret Davis: "Mustafa Kemal Ataturk brought many things to Turkey as he pulled it out of the Ottoman Age and into the modern world: an alphabet, a secular government, freedom from capricious and oppressive religious rule, and a sold sense of patriotism in the land where Europe and Asia meet. He also brought tango. "A Tango with Ataturk, based on a story about a 1926 reception that Ataturk hosted as his nascent country's new leader, imagines what happens from the perspective of a female tango dancer that night... "
"There can be no revolution without music." "We women face our partners, our hair and ankles naked, ready for the transcendental power of the dance. We will help destroy another taboo." Portland, Oregon: Ma Nao Books, 2003. Edition of 50. 4.5 x 8" with 26 pages. Original hand-lettered in Lloyd Reynolds "Oregon" italic reproduced digitally. In a sewn daifuku cho Japanese binding with distinctive cover papers. A story of international intrigue and mischief, "Bahia Night" details South American sensuality in cinematic takes. Expats and Brazilians mix it up in an open-air bar in Bahia, where flirtations percolate like a samba beat and a foolproof dating method gets put to the text. Portland, Oregon: Ma Nao Books, 1999. Edition of 100. 22 cm; 20 pages. 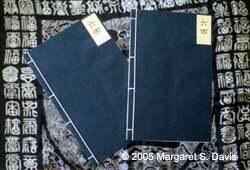 Handbound in traditional Chinese style, with silk thread over dark blue wrappers. Illustrator/binder/publisher Davis has also lived and worked in China, as managing editor of Beijing Scene, a newspaper that was finally shut down by the government. She studied traditional binding techniques while there. On the eve of the infamous anti-democracy massacre in Tiananmen Square, Larry Hanbrook joined Chinese activists in their makeshift campground, giving witness as the tanks rolled in upon them. In these sharply observed vignettes, he has captured the humanity and tensions of these mostly young people whose struggle continues even today. After the crackdown, Hanbrook went to Hong Kong for a time, where he operated a safe house for activists escaping from the mainland. 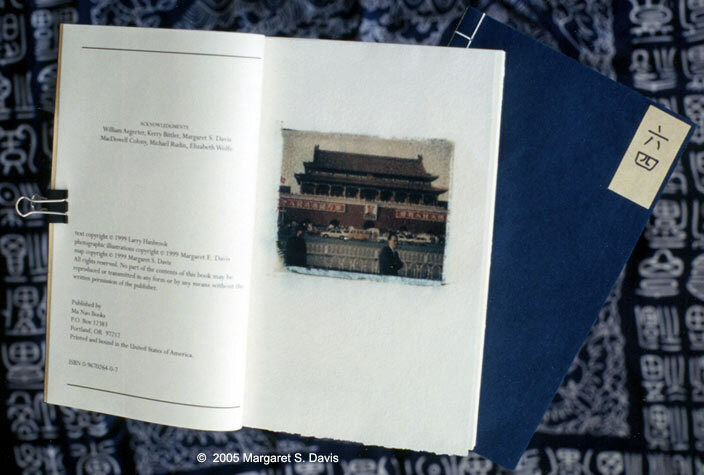 Now his essay, illustrated with three photo-transfer images by Margaret E. Davis, has been issued to commemorate the tenth anniversary of the most painful and pivotal event in the ongoing quest for Chinese democracy.